In 2005, Rodney Conway and his wife, Vicki, paid $340,000 for their 950-square-foot two-bedroom home in Richmond, California, a blue-collar city in the Bay Area. Today the home is worth about $140,000. But the couple still owes $320,000 and makes monthly mortgage payments to the Bank of America. “We’re basically renting this house for $2,000 a month,” said the 52-year-old Conway, who was disabled while serving on a Navy ship in Lebanon in 1983. In almost every part of the country, entire neighborhoods—and in some cases, whole cities—are underwater. They are not victims of natural disasters like Hurricanes Katrina and Sandy. Like the Conways, they are drowning in debt, victims of Wall Street’s reckless and predatory lending practices. Since 2006, when the speculative housing bubble burst, home prices have plummeted; homeowners have lost more than $6 trillion in household wealth. Many now owe more on their mortgages than their homes are worth. Despite rising home prices in some parts of the country, more than 11 million American families—one-fifth of all homeowners with mortgages—are still underwater, through no fault of their own. If nothing is done, many will eventually join the more than 5 million American homeowners who have already lost their homes to foreclosure. The nation’s worst underwater “hot spots”—disproportionately black and Latino areas—are places that banks targeted for predatory lending, often pushing borrowers into high-interest, risky loans, even when they were eligible for conventional mortgages. Many have lost their jobs or seen their incomes fall as a result of the recession and are having difficulty paying the bills. Dallas, Las Vegas, Miami, Houston, San Bernardino, Tampa, Jacksonville, Phoenix, Atlanta, Orlando, Stockton, Reno, Modesto and Detroit are among the most troubled “hot spots,” but there are many other communities with huge inventories of underwater mortgages and where home prices are not participating in the recovery. The problem is contagious. Communities with many underwater homes bring down the value of other houses in the area. 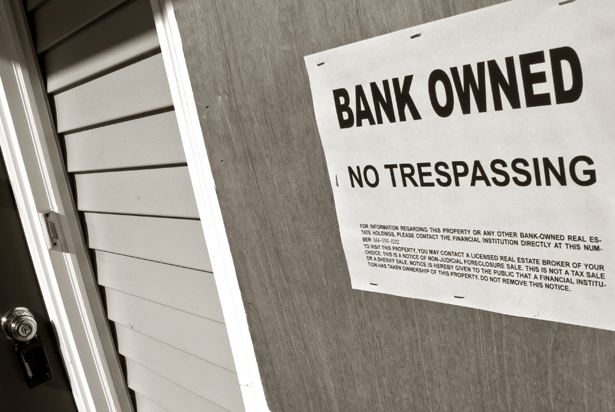 Foreclosures alone have drained at $2 trillion in property values from surrounding neighborhoods, according to a Center for Responsible Lending study. The resulting decline in property tax revenues has plunged some cities into near-bankruptcy, lay-offs and cuts to vital public services. Many economists, including Joseph Stiglitz and Mark Zandi, agree that the best solution is “principal reduction,” where banks lower the borrower’s mortgage principal. This is not an act of charity but a way to reverse the economy’s freefall. If underwater mortgages were reset to fair-market values of homes, it would help homeowners and communities alike, and pump about $102 billion into the economy annually, according to a Home Defenders League report. But homeowners who have asked banks to modify their mortgages typically get a cold shoulder or a bureaucratic runaround. So far, the Obama administration and Congress have been unwilling to require intransigent banks to reset loans. Faced with this quagmire, a growing number of cities—with the support of community groups and unions—are taking things into their own hands. Thanks to a legal strategy initially formulated by Cornell University law professor Robert Hockett, city officials have discovered that they can use their eminent domain power—which they routinely use to purchase property for sidewalks, infrastructure, school construction and other projects—to buy underwater mortgages at their current market value and resell them to homeowners at reduced price and mortgage payments. Richmond is the first city to pursue this strategy. Its city council—with the support of the Alliance of Californians for Community Empowerment (ACCE), which for years has organized homeowners against predatory banks—recently voted 6-0 (with one member absent) to make offers to buy underwater mortgages. If lenders refuse, the city will take them by eminent domain and work with a group of friendly investors (Mortgage Resolution Partners, or MRP) to refinance the loans with the Federal Housing Administration. In this city of 103,000, dominated by a big Chevon oil refinery, home prices have plummeted by 58 percent since the 2007 peak. Homeowners lost over $264 million in wealth last year alone. Thousands of Richmond homeowners have lost their homes to foreclosure, and many others, like the Conways, are just hanging on. About 12,000 families—half of all homeowners with mortgages in the city—are underwater. The city government, which has lost millions of dollars in property tax revenues, has cut funds for road repairs and significantly reduced the number of municipal employees, including librarians. Meanwhile, it has had to spend scarce funds to deal with abandoned buildings, crime and drugs, and other problems caused by the foreclosure epidemic. If banks reset Richmond’s underwater mortgages to fair market value, homeowners would save an average of over $1,000 per month on their payments. If those savings were spent on local goods and services, it would generate about $170 million in economic stimulus and create at least 2,500 jobs. This situation is particularly bizarre for homeowners whose mortgages were sold by banks to pools of private investors—an industry gambit called “private label security” (PLS) mortgages. The trustees for these mortgages—owed by dozens or hundreds of distant investors as part of a pool—claim they lack the authority to modify them. Richmond is initially targeting these PLS loans so they can get the homeowners into sustainable mortgages with reduced principal. MRP, Richmond’s funding partner, has agreed to a set of community-drafted principles to make sure that investors don’t exploit desperate cities and homeowners. It has pledged, for example, that the program won’t cost taxpayers a dime. MRP will earn a flat fee per mortgage. Homeowners can voluntarily opt out of the program. Wall Street is up in arms. Since several cities began discussing this strategy last year, industry lobbyists have been fighting back. In a coordinated effort involving letters, phone calls and meetings, some of the nation’s most powerful lobby groups—including the National Association of Realtors, the American Bankers Association, the National Association of Home Builders, American Securitization Forum, and the Securities Industry and Financial Markets Association (SIFMA)—have tried to dissuade local officials from pursuing the eminent domain strategy. In April, for example, SIFMA officials Kim Chamberlain and Tim Cameron traveled from New York to Richmond to persuade Mayor Gayle McLaughlin and her Council colleagues to back off. The Wall Street lobbyists have threatened to mire local governments in expensive lawsuits if they use eminent domain to take troubled mortgages. But MRP has agreed to cover the costs of any potential litigation, so most city officials recognize that this is mostly an empty threat. The lobbyists have also warned local officials that if they go through with these plans, banks will increase the cost of future borrowing or even shut down credit entirely. They couch these warnings as if they were mere predictions. But they’re threats—part of a coordinated, industry-wide credit boycott. This is another form of “redlining” (lending discrimination), which violates the nation’s fair lending and antitrust laws. A recent editorial published by The Wall Street Journal echoed the industry line that the eminent domain strategy is both illegal and ill-advised. To pre-empt local governments, three Republican congressmen from California last month sent a letter to Housing and Urban Development Secretary Shaun Donovan on behalf of the industry, asking HUD to deny FHA financing from mortgages taken by eminent domain. Last year the financial, real estate and insurance industry topped the list of contributors to all three politicians—Gary Miller ($366,000), John Campbell ($484,000), and Ed Royce ($1 million)—according to OpenSecrets.org. “We are concerned that the proposed use of eminent domain would slow the return of private capital to the housing finance system, and threaten our fragile housing recovery,” they wrote Donovan. Sound familiar? Throughout the last century, business lobby groups have consistently warned that government action to protect consumers, communities and workers—mandatory seat belts, the minimum wage, consumer protection laws, workplace safety rules and others—are “job killers” and business destroyers. Their dire warnings were bogus, but they repeat them so often that they often sound convincing. Like their predecessors, the bank, securities and real estate lobby groups are crying wolf. They can file nuisance lawsuits, hire lobbyists and get the occasional hired-gun economist from a conservative think tank to peddle their propaganda, but cities have a legal right to use eminent domain to restore community wealth stripped by reckless banks. Even so, Wall Street’s intimidation ploy has worked in a few places. Earlier this year, elected officials in San Bernardino—where half of all homeowners are underwater—backed down after industry lobbyists swooped down on that troubled community an hour from Los Angeles. But in Richmond, Seattle, Newark and other cities—where community groups and unions have mobilized angry homeowners and their neighbors—local officials are determined to move forward, aware that they have the law and economics on their side. In Oregon, lawmakers devised a clever way to tackle student debt.